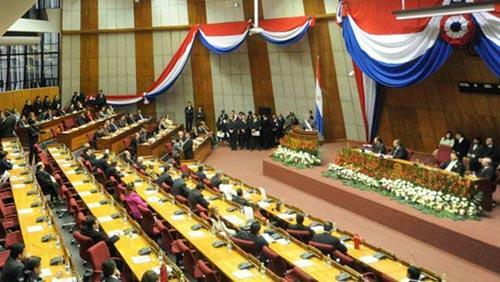 Paraguay’s Chamber of Deputies has adopted a declaration condemning the massacre committed in Khojaly town of Nagorno-Karabakh region of Azerbaijan in 1992, the Parliament informed on December 21. The document reads that the Khojaly massacre was the biggest attack civilians suffered during hostilities between Armenia and Azerbaijan. The ethnic massacre took lives of 613 Azerbaijanis, including 106 women, 63 children and 70 elderly, while 1,275 Khojaly residents were taken hostage and the fate of 150 of them remains unknown. Moreover, 487 residents of Khojaly, including 76 children, were left disabled, 130 children lost one parent and 26 lost both of them. The declaration notes that this fact is documented by various agencies of Azerbaijan and independent sources. 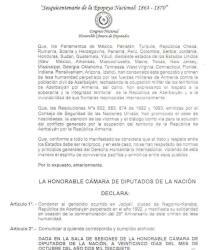 The Paraguayan MPs note in the declaration that many countries condemned this crime against humanity and the genocide committed by the Armenian armed forces against Azerbaijani civilians as well as the military occupation of Azerbaijani lands by Armenia. The countries expressed their respect for Azerbaijan’s territorial integrity, sovereignty, and inviolability of its internationally recognized borders. The document also reads that four resolutions of the UN Security Council adopted in 1993 urge to stop the occupation, to focus on the victims and a dialogue as a way to resolve the conflict that arose due to the occupation of Azerbaijani territories by Armenia. The Chamber of Deputies of Paraguay condemned the genocide in Khojaly and expressed solidarity with Azerbaijani people in commemoration of the victims of this crime against humanity. 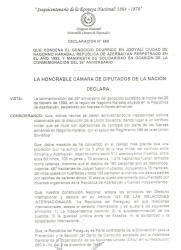 Besides Paraguay, the parliaments of many countries, including Pakistan, Mexico, Turkey, Colombia, Guatemala, Peru, Romania, Serbia, Bosnia and Herzegovina, Czech Republic, Jordan, Israel, Sudan, Honduras, Djibouti as well as the legislative bodies of 20 states of the U.S., have adopted resolutions to recognize this tragic crime as a genocide.